One of the greatest challenges for style conscious women is packing. Dressing beautifully is difficult when you have your entire closet at your disposal, but can be infinitely tricky when you only have a suitcase to choose from. That is why packing “smart” is so important! Considering all possible scenarios during your trip is the key to smart packing. Plan for the situations you know about and attempt to anticipate all of the situations that may occur when you’re on your trip: rain, unseasonable heat/cold, an impromptu formal party, an impromptu casual hang, or even having a fat or a skinny day! It’s easy to say that you can just buy whatever you need to at your destination to supplement your travel wardrobe but that is a very dangerous game to play because it leads to frantic (and expensive) purchases you would never make at home. As I have said many times, shopping while travelling should be driven by fun and not necessity — buy amazing items you cannot purchase at home. But, in order to live by that mantra, you must take the time to pack wisely with consideration to various situations – planned and unplanned – that you may find yourself in. Wear all of your precious jewelry on your person when you fly (diamond studs, rings, necklace, etc). Any jewelry you don’t wear should be kept in a pouch in your carry-on bag. NEVER check these items because bags often get lost and most airlines only reimburse for a modest amount. But, be mindful of your selections. Choose an understated watch over your favorite gold oversized Rolex. This has never been more important as Kim Kardashian’s robbery has recently taught us. Potential thieves don’t care if the jewelry is being worn by a reality star or someone not as well-known. Anything else you bring should be costume/novelty jewelry that works with your travel outfits but would not be devastating to lose. Pack pieces with the same color pallet, so that they can all work with each other and be mixed and matched to look new. Anticipate that these unanticipated occasions may occur: one dressy event, one very casual event, and one of your outfits will malfunction (broken zipper, missing button, tear, or unraveling seam). While these things may not happen, I think we all know from experience that they can! Packing an extra outfit is much less of a burden than frantically running around your hotel room trying to figure out if you can sew up a seam with the hotel stapler (and, yes, this has happened)! Room, room, room, room, room. Did you know that your favorite outerwear piece can take up the room of 2 to 3 outfits in your luggage? Since suitcase room is not infinite, my best advice is to wear your largest coat on the plane. Simply hang it or put it in the overhead compartment to get it out of the way during your flight. Don’t forget to pack a lighter outerwear piece in your suitcase. Take one functional purse that will work with all of your outfits and is easy to carry. My favorite is the Celine Trio Bag (pictured). This cross body bag is easily accessible and visible during travel. It features three separate zip compartments that can be separated. Use one compartment as a clutch for an evening bag. Use another compartment as a travel bag to hold your money, passport, and valuables. 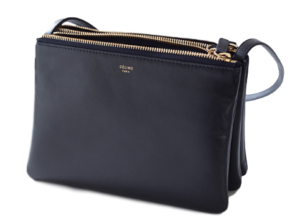 This Celine bag is classic, elegant and functional. A perfect one stop shop bag for all your travel needs! This is the one time to be more practical! Always wear comfortable shoes for travel and bring a day and evening option that works with all of your clothing options. 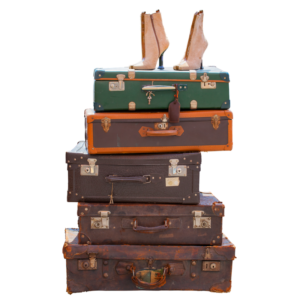 Keep in mind that shoes take up too much room and will add extra pounds to your suitcase. Taking the extra time before your trip to pack right insures that you can enjoy every moment of time during the trip, while looking effortlessly incredible! Happy travels!